Costco is the largest wine retailer in the USA. That’s a bit weird, but as America has such bizarre laws about shipping and selling wine, it’s perhaps not surprising. Wine wholesale and distribution practices in the US are not a cartel or a racket, no siree bob, absolutely not, no organised activity there at all. Just keep walking, nothing to see here. I’ve previously shopped at Costco for branded wines I know and trust – Ravenswood, Brancott and Campo Viejo are often on the special offer rotation there, making them a good buy in a convenient carry home case size. I was feeling brave so I decided to branch out and try some Costco own brand wines too. This ’13 Costco Signature Series Chardonnay was a cheerful yellow colour, bringing a bit of Californian sunshine into an otherwise grey autumn day. It smelled oaky, with the toasty, buttery aromas you’d expect from a sensibly priced Californian Chardonnay. It’s somewhere between dry and off dry. It’s not off puttingly off dry, just a hint of sugar in there, but it works. It tasted less oaky than those 1980’s “Chablis” wines that took the world by storm, it’s a more restrained, refined bottle. There’s apples and fresh pineapple as well as bit of candied fruit, and melon. There’s a touch of lemon in the acidity, and then the oak smooths it out. It’s at the upper end of medium in alcohol, which along with that bit of sugar and some oaky tannin pushes the overall body and mouth feel up too. It’s a comforting wine. At around £12, it’s not a bargain bucket wine, nor a budget buster, just a sensibly priced one, that stand up well to salmon and to creamier pasta sauces. 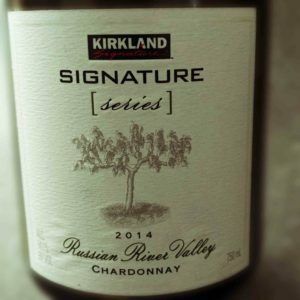 I will continue to investigate Costco’s Kirkland wine options and report back.